Did you all have a good weekend? I hope so. Mine was just great with my family. Wish everyone has a good start for this week. I will be very busy with 2 big weddings coming up, hubby's birthday, my girl's birthday, kids' 1st semester exam, Christmas, holiday, and some others things on my list ... phew!! So today's bento was a quick and simple bento, it only contained fried rice and fruits. I used my Kokeshi Bento Box (Ichiro & Hanako) from Bento&co. The round box is pretty small so I put fried rice in 2-tiers Hanako box, and put the fruits, tomato ketchup in 2-tiers Ichiro box. I love to prepare fried rice with different ingredients. This time I put a finely chopped carrots, baby bok choy, Chinese chives, onion, red paprika, egg, and lap cheong (Chinese sausage). I ate one small bowl this morning for my breakfast, couldn't resist the temptation really. Added a little cuteness, a girl from the quail egg sunny side up, decorated with nori and tomato skin. Tada! No need a long time to prepare it this morning. Love your speedy bento, great presentation. hmm..yumm yumm...We love fried ricea lot..esp with the lap cheong and salted fish..hehe. Love how you decorated the fruits and the lap cheong flower, and the cute little quail egg girl...so lovely. 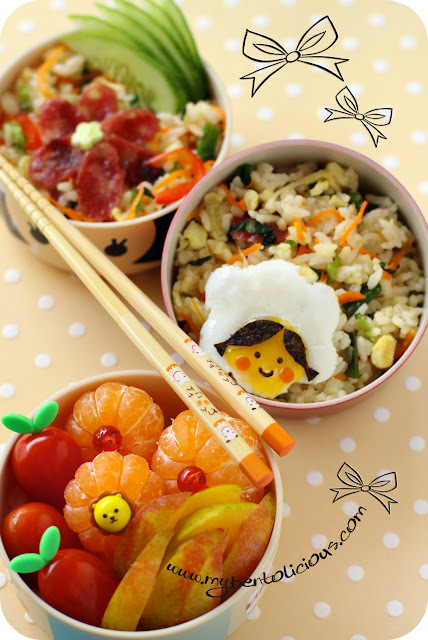 very cute and simple bento: perfect for me! For a quick bento yours is superb ! What a busy programm for next weeks ! @prince n princess mom : Thanks a lot dear! I just love it. Just the right size for me. I also like to use different ingredience in my fried rice. It looks so tasty. This is so cute Lia! I love how you made the sunny side up work for you. Your fried rice looks amazing! Love it. I love this bento, looks really yummy! and love the quail fried egg girl, so cute, It's a nice idea! @Bobo : Thanks a lot Florence! The egg white looks like a chef's hat, doesn't it? Ugh, just remembering it is the end of the year, with so much to do makes me nervous! You will manage well your schedule ^_^, you might be much more organized than I :P.
@karaimame : Thanks a lot Lilian! So sweet of you. Told myself to relax but couldn't ... end of the year seems I will be going crazy LOL :D Can't believe a new year will come soon.